Please have a look at some of my published articles when you've finished the news page. Or use the links above. This collection of new work for the stage has become a regular Autumn event at Burnham Library. My contribution to this year's Showcase will be The Honeymoon a twenty minute comedy. Candice and Philip married quickly after she rescued him from a brawl in a pub - some thugs had stolen his pike. She was on the rebound from men in general and he was – he was just Philip, a type of man she had never met before, a type she had never considered having a relationship with. They were both surprised when he swept her off her feet. He planned the wedding, an event that involved several surprises for Candice, and now he has planned the honeymoon. Will this be a surprise too far? Has Candice realised Philip’s unusual interests do not exactly coincide with hers? Will Philip be able to save the relationship, especially in the honeymoon venue he has chosen? And what part will Sid play in all this? Jayne Larson-Edgar will play Candice in The Honeymoon. 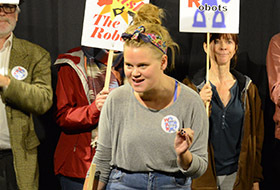 The picure on the right shows Jayne as she appeared in my play Last Woman Working in which she portrayed one of the leaders of a workers' revolution against the rise of the robots. If you want more information about The Honeymoon or the showcase event use the link on my contact page. Wycombe Sound broadcast an evening of Christmas celebrations including two of my stories written for the festive season Santa's Best Ever Helper and A Christmas Gift. Pic left shows Lorraine Forrest-Turner reads Santas Best Ever Helper. 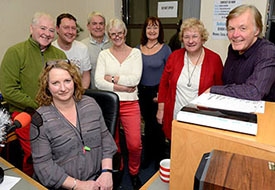 The group picture shows Pippa Sawyer seated with members of Slough Writers who took part in the broadcast. I'm on the right. This autumn Slough Writers presented the third DRAMA SHOWCASE at Burnham Library. This was an evening of five short plays. My contribution was Eleven Fifty-Six a 20 minute drama which has been performed across the UK and in Australia and America. It was also the winner of the Total Theatre One Act Play Award. 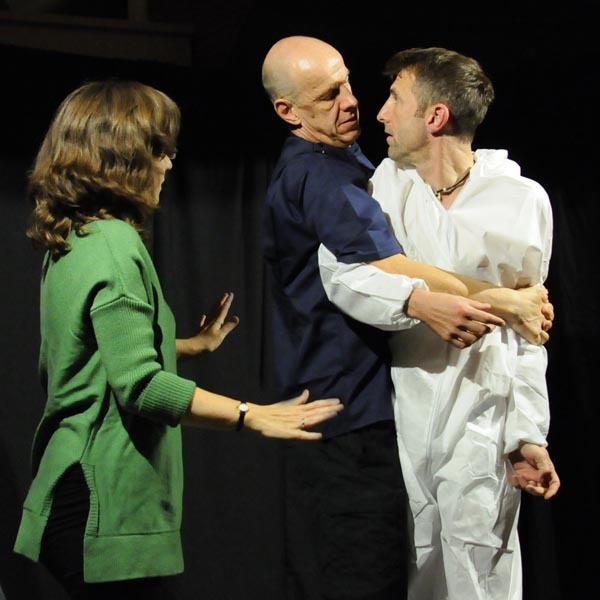 Jane Heptonstall, Paul Stimpson and Colin Jeffery appearing in Eleven Fifty-Six. Lazy Bee Scripts are now the publisher for Eleven Fifty-Six. I was very pleased to win the SW annual article writing competition. 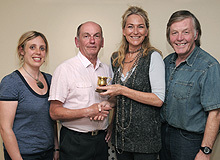 The theme was secret Berks and Bucks and it was judged by journalist Janice Raycroft. I set out to write a piece about Hitcham Farm in Burnham where they have begun making ice cream as a diversification from dairy farming. But the piece grew into a story about the demise of smaller farms in the UK. My entry went under the title Scooping a New Future Down On The Farm. Read it here. 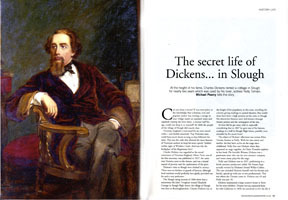 Dickens rented a cottage in Slough for his lover Nelly Ternan in 1866. She stayed there for eighteen months and there is strong evidence she may have been pregnant during this time. It is an intriguing love story for Valentines. Go to Articles to read the piece. 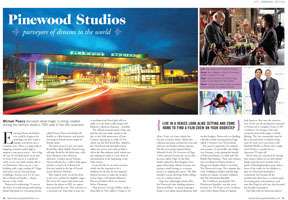 My article about Pinewood Studios and their 75th anniversary year appeared in the December issue of Berkshire Life. Go to Articles to read the piece. My story An Unexpected Act Of Mercy won first place in the Slough Writers summer competition. Joint second were Sally East (All That I Am) and William Campbell (Angel’s Trumpet). This competition was judged by the members taking part who voted for their favourite story. 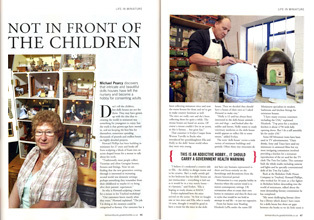 The November issue of Buckinghamshire and Berkshire Life magazine carried two of my articles, a total of eight pages. 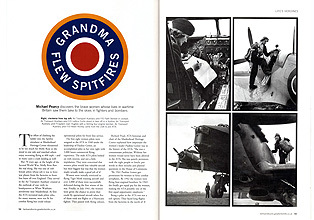 The subjects were the adult interest in dollshouses and women who flew Spitfires and bombers in WW2. Go to Articles to read the piece. 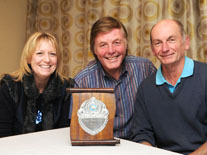 Kay Woods (newcomer of the year), Wendy Naylor (services to Slough Writers) and Mike Pearcy (writer of the year). 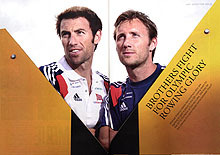 The July issue of Buckinghamshire and Berkshire Life magazine carried my four page article on two brothers competing for Olympic rowing glory in 2012. Go to Articles to read the piece. 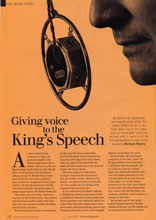 The June issue of Writers' News magazine carried my four page article on the genesis of the King's Speech screenplay. Go to Articles to read the piece. On Monday 18 April the winners of the Slough Writers short story competition were announced. I came second with my story Walking On Quicksand. 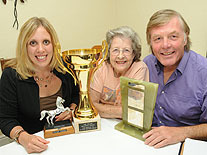 The picture also shows Kay Woods (third), William Campbell (first) and the judge Mel Gow editor of Beat magazine. 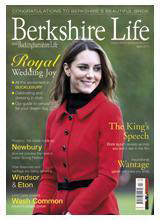 My article Is Royal Intrigue Hiding In Your Loft was published in the April issue of Berkshire Life magazine. 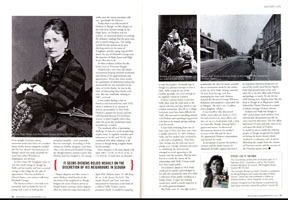 The article is about the book The King's Speech based on interviews with the two authors who visited Windsor to promote the book. Go to Articles to read the piece. The Liverpool Network Theatre Group's production of The Gatekeeper's True Religion was a great success. It was in a double bill with Caryl Churchill's Far Away. The director Kevin Foott said the cast all enjoyed the challenge and the production gripped the audience with the mixture of drama and lighter moments. We Shall Overcome a story set during the cold war was shortlisted for the Southport Open Short Story Competition. It is set at the time of the government's Protect And Survive campaign and features a teenage girl facing the reality of the nuclear threat and going on her first CND march - much against her father's wishes. Issued in 1963, this booklet explained how to survive a nuclear attack. Even in the dark days of the cold war it was thought to be optimistic. My not so short story (5000 words) The Great British Soviet won the Slough Writers summer competition. This story is about what happened when Britain was invaded by the Russians in 1945 after President Henry Wallace withdrew American forces from Europe (Yes, it did happen - honest). It follows the struggles of one family to survive the new order. Winners of Slough Writers Summer Competition. SUCCESS AT WATERSTONES. 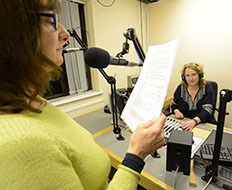 On The Tringham Trail was one of four fifteen minute radio plays read as a radio performance with sound effects in the Slough bookshop to an audience of 60. The plays were written as part of the Slough Centre Stage project initiated by BBC Radio Berkshire. Lazy Bee Scripts have become the publisher for The Gatekeeper's True Religion. Stuart Ardern of Lazy Bee reported that his reviewer was very enthusiastic about all aspects of the play, and remarked "One of the most outstanding things about this play is the sly humour that keeps cropping up. I was expecting gloom, something along the lines of “Uncle Vanya”, and instead I was laughing out loud." My play Whistleblower under the title Ashes On The Wind (don't ask!) 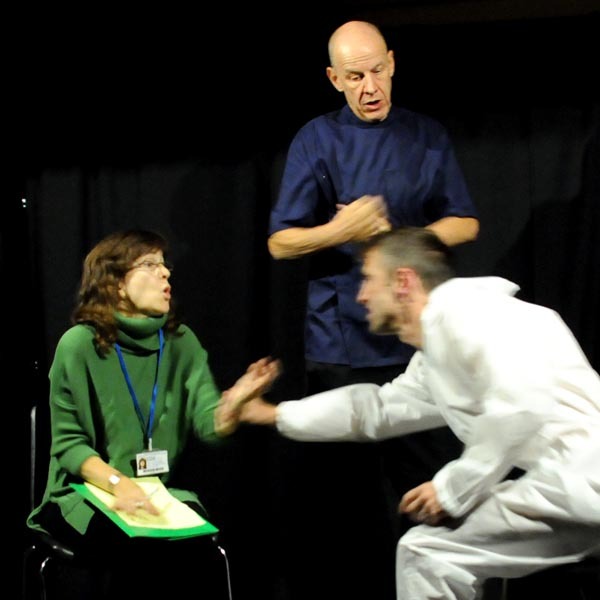 was one of 16 shortlisted plays out of an entry of 236 from 13 different countries in the Drama Association of Wales 2009 One Act Play Festival. I have been invited to contribute to a project celebrating the mood of The Sixties. Next year will be the fiftieth anniversary of the start of that fabulous decade. Writers have been asked to take a sixties song as the inspiration for a short story which will be published with a CD of the songs. I selected We Shall Overcome and wrote about a teenager coming to terms with the fear of nuclear war which was very real at the time. The publishing agent said "...this piece of writing...sheds a little light relief, compared to some of the other stories in the book. Also I think it is important that the nuclear threat and the response of people during that time is included in this project. 'We Shall Overcome' is a vital contribution. If this book is a celebration of The Sixties, it is inevitably a reminder of the era - and this is too big a topic to omit."